Nursing home injuries in Houston, TX are not unheard-of in patient care. They can be caused by nurse under-staffing, poor employee training, neglect, or abuse. If you trust a nursing home to care your elderly loved one, it pays to be aware of the different nursing home injuries in Houston, TX. By doing this, you will learn when to consult a lawyer. At Camberg Law Firm, our lawyers are dedicated to helping our clients seek a favorable outcome in nursing home injury legal cases. Whether it is litigation for a nursing home injury in Houston, TX or other elderly care conflicts, our lawyers can excellently represent you in the courtroom. A nursing home injury in Houston, Texas includes bedsores. Bedsores are a nursing home injury in Houston, TX caused by prolonged pressure on the skin. They typically form on the bony parts of the body, including ankles, heels, hips, and tailbone. If a caregiver fails to shift an aging patient’s bed position at regular intervals, the elderly individual will be more prone to these nursing home injuries in Houston, TX. Besides the development of bedsores, nursing neglect can cause other nursing home injuries in Houston, Texas. This is a form of nursing home abuse, and you should quickly contact an elder care lawyer if you know someone who has experienced this. The legal professionals at Camberg Law Firm are experienced in handling court cases of a nursing home injury in Houston, Texas. When hired as litigators, our lawyers treat our cases with compassion, dignity, and tenacity. Whether our lawyers file lawsuits for a nursing home injury in Houston, TX or other issues, our attorneys will do everything to arrive at a favorable outcome for the plaintiff and his or her family. Among the considered nursing home injuries in Houston, TX is weight loss. If an elderly individual is not receiving proper nutrition, his or her weight fluctuates. Apart from malnutrition, a weight-related nursing home injury in Houston, TX can also be caused by dehydration. If your aging family member is not drinking enough water, the nursing staff members in charge may not be fulfilling their duties. The elderly are admitted to nursing homes to be given relief. When aging individuals get a nursing home injury in Houston, TX because of health care malpractice, it is time to consult with legal professionals. Victims of nursing home injuries in Houston, Texas may feel helpless, but our lawyers at Camberg Law Firm are here to be your legal confidant, support, and defender. With our extensive experience in cases involving a nursing home injury in Houston, TX, our lawyers will help you seek justice and prevent similar injustices in the future. 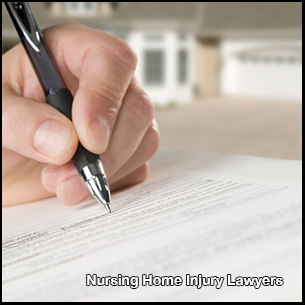 Nursing home injuries in Houston, TX include falls and fractures. Osteoporosis is common among aging patients. This makes a debris-cluttered or slippery floor more dangerous for them than younger people. If elderly individuals are not carefully monitored in a nursing facility, they are at higher risk of falls and fractures, as well as other nursing home injuries in Houston, Texas. Concussions are also among the common nursing home injuries in Houston, TX. With the increased risk of neglect, slipping and falling, elderly individuals are prone to nursing home injuries in Houston, TX that concern the head. Close to the brain, these nursing home injuries in Houston, TX can be fatal and life-threatening. If your aging family member gets a nursing home injury in Houston, TX because of neglect in health care, you have to consult with an elder care lawyer. Camberg Law Firm litigators fight for what is fair and help our clients recover from conflicts, including nursing home injuries in Houston, Texas. Seek justice for your loved one and prevent future nursing home injuries in Houston, TX by working with our elder law lawyer. At Camberg Law Firm, our lawyers make sure that our clients are heard and justice is served. To learn more about a nursing home injury and neglect in Houston, TX, visit www.camberglawfirm.com. When it comes to getting sound legal advice and seeking legal aid, you should only trust the established professionals. Camberg Law Firm is dedicated to providing professional yet personal legal services to every client. Our lawyers focus on personal injury, business/commercial, probate/guardianship, and dangerous drugs/device litigation. Today, he is an exceptional lawyer and is in fact among the very few professionals certified in Personal Injury Trial Law by the Texas Board of Specialization. In addition, he is also board-certified by the National Board of Trial Advocacy and is a member of the exclusive Million Dollar Advocates Forum, The Top Trial Lawyers in America. Camberg Law Firm is able to address both the probate and guardianship legal cases. Probate is the legal process needed to settle a decedent’s estate. This includes appointing a lawyer and distributing the deceased’s estate to the rightful heirs and beneficiaries. For professional yet personal legal services, turn to Camberg Law Firm. Whether you were involved in a road accident or are the victim of medical malpractice, our attornneys will take the time to listen to your every need. You can call our local number 281-486-6900 or our toll-free number 800-922-9775 to schedule a free case evaluation.